It's the latest in child security--a device that tracks kids. Heightened awareness of missing children in the past few years has spawned a range of devices to alert parents when their kids are in danger. The newest, Guardian 1, goes a giant step further. It's the first to assist in tracking and locating a missing child. 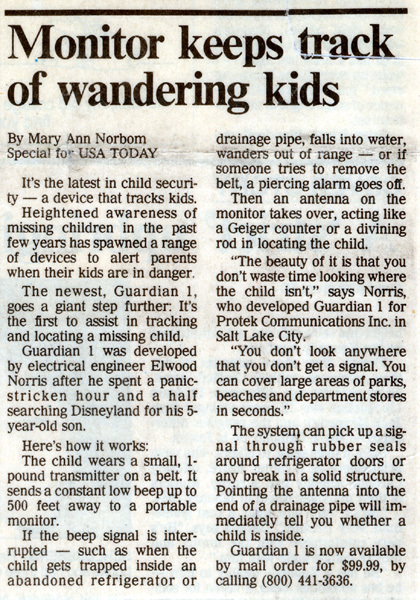 Guardian 1 was developed by electrical engineer Elwood Norris after he spent a panic-stricken hour and a half searching Disneyland for his 5-year-old son. The child wears a small, 1-pound transmitter on a belt. It sends a constant low beep up to 500 feet away to a portable monitor. If the beep signal is interrupted--such as when a child gets trapped inside an abandoned refrigerator or drainage pipe, falls into water, wanders out of range--or if someone tries to remove the belt, a piercing alarm goes off. Then an antenna on the monitor takes over, acting like a Geiger counter or a divining rod in locating the child. 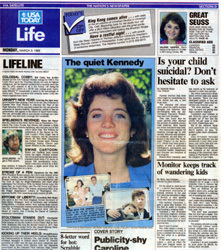 "The beauty of it is that you don't waste time looking where the child isn't," says Norris, who developed Guardian 1 for Protek Communications Inc. in Salt Lake City. "You don't look anywhere that you don't get a signal. You can cover large areas of parks, beaches and department stores in seconds." The system can pick up a signal through rubber seals around refrigerator doors or any break in a solid structure. Pointing the antenna into the end of a drainage pipe will immediately tell you whether a child is inside. Guardian 1 is now available by mail order for $99.99, by calling (800) 441-3636.